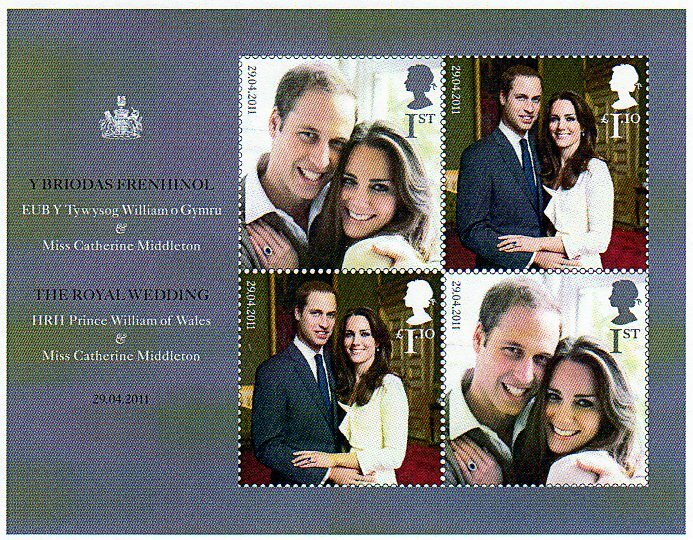 It's far easier to do a rush job with a miniature sheet than with a set of stamps so despite the wedding being announced months ago, Royal Mail is issuing a miniature sheet for the wedding of Prince William of Wales to Miss Catherine Middleton on 29 April. The sheet will be issued before Easter on 21 April. For more details and (later) associated postmarks, see our website. I think it is really hard to distinguish the 1st from the 1.10. Basically your eye sees the big numeral 1 and the rest gets lost. I wonder if people who are actually using these stamps (are there any?) will get confused. A very interesting point, and one which I hadn't noticed, Larry. Yes, given that many people don't know the actual price of a 1st class stamp, I wonder how many people will use all four stamps - at 78p each, rather than the 46p cost of a 1st class stamp.